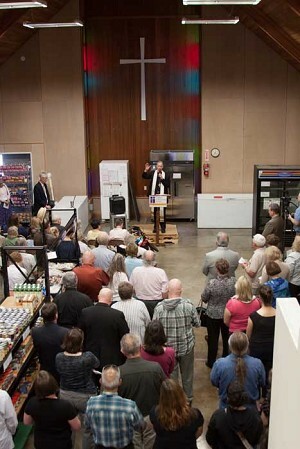 Archbishop Alexander Sample blesses food pantry in Springfield. The outlet is now open on Saturdays. SPRINGFIELD — In an effort to help working families, Catholic Community Services of Lane County has begun Saturday food pantry hours at the Springfield Community Service Center. Hours are 9 a.m.-1 p.m.
Catholic Community Services now distributes food on Wednesdays, Fridays and Saturdays at the Springfield location, 1025 G Street, and will continue hours on Monday, Wednesday and Friday at the Eugene location, 1464 W. 6th Ave. At both places, supplies come from FOOD for Lane County and major operating funding is provided through the Lane County Human Services Commission. The community service centers provide food, free clothing and personal care items, bus passes and other emergency assistance to homeless and low-income persons, as well as utility aid, temporary shelter and short-term financial assistance to prevent homelessness. More than 10,000 low income households each year get help at the two centers.